Queen City Nerve, editor-in-chief Ryan Pitkin talks weekend entertainment with All Things Considered Host Mark Rumsey. A weekend from now, there'll be a lot of buzz around Charlotte with the NBA All-Star game taking place. But it's no reason to sit around this weekend and do nothing — unless you just want to. There are some interesting things on the calendar for entertainment in Charlotte this weekend and Ryan Pitkin, editor-in-chief of Queen City nerve, talked with "All Things Considered" host Mark Rumsey about them. Mark Rumsey: So I know it's kind of a mixed bag this weekend. A lot of different things going on. What's kind of popping out for you? Pitkin: I think the one thing that I've been looking forward to the most would be the "Where the Wild Women Art" show at Crown Station on Sunday night, and that'll sort of be a way to wrap up the weekend. But it's definitely worth a visit. It's sort of an art show/ music show/ vendor spot. So, it's got the whole trifecta and it’s at a coffeehouse and pub. So, you just keep adding reasons to go. Pitkin: A little bit a little play on the old children's book there. But that's going to be held by some of the coolest women in the town who do visual arts from Phoebe Alicia, also known as Phoebe Teeters or Phoebe 13-13 when she's doing her skateboard decks. You got Sharon Dowell, a lot of people know her around town, Lavonna Parks who also does some skateboard work, among other stuff. And then you also have some live performances from Modern Primitives. That's one of my favorite local bands here in Charlotte, if not my favorite. Then also Liza and Claudio Ortiz, a brother-sister duo from the band CHÓCALA will be there. It will just be the two of them, not the full band, but they are definitely worthy of a listen. Just the two of them as well. 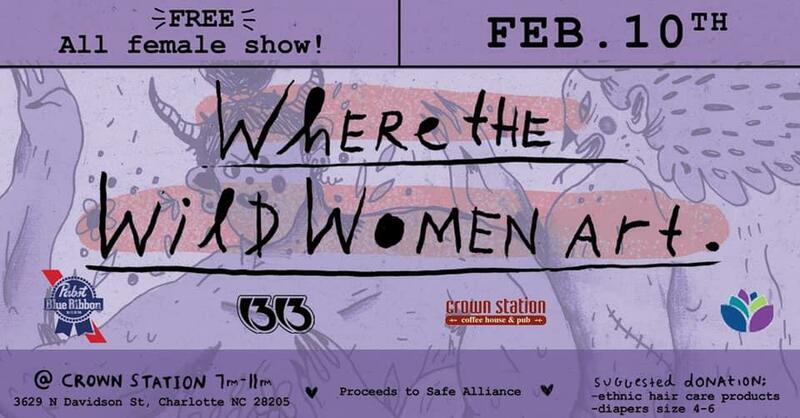 Where the Wild Women Art flyer. Rumsey: Is [the art show] a new event? Pitkin: Yeah, I don't believe it's been held before. Phoebe is the organizer behind it and there are plenty more artists beyond what I just named. [There are also] cool vendors and stuff. But I think that it’s an inaugural event. I'm not sure if it's planned to be held again, but I definitely am looking forward to seeing how it goes for the first one. Rumsey: Well let's scoot down to the sort of conventional uptown arts district, art zone. What do you see happening there? Pitkin: Absolutely. We’re moving backward then, to Friday and Saturday, from the local Caroline Calouche & Co. And I apologize if I'm mispronouncing that because I've always had a problem with that one, but they do some amazing work around the dance here in Charlotte. They will be performing at the Booth Playhouse for Blumenthal Arts. They'll be doing their show "Rouge," which is sort of a mix on aerial and Cirque de Soleil type of feel. You know, everybody's really into aerial these days and you can count on Caroline Calouche & Co. to sort of mix that up and step it up. Rumsey: And like I said, it's kind of a grab bag of things going on this weekend. So let's grab one more. Pitkin: Right. And if you are a creative yourself and you want to get engaged, you can go to Con-Tagion — which is a convention for creatives. That's happening Saturday at the Queen's University Sports Complex. So it's billed as being for creatives by creatives. And it's sort of a networking opportunity, but also just a convention for workshops to sell art, trade art, to learn some new things around design and visual arts, and around really anything in the creative world here in Charlotte. And it's a great way to meet new people in your field. If you've been sort of locked in for the winter, it's a great way to get out and start meeting new people for 2019, I think. Rumsey: I know it's still a few days off, but I alluded to there's a lot of basketball coming up with the All-Star game not to mention the CIAA tournament coming to town. I know the planning is underway and at a lot of venues certainly already. Pitkin: Right. And we in our Queen City Nerve issue number six, we will have a full guide for all sorts of All-Star day parties and night parties throughout the weekend for you to attend, as well as a little bit of a guide to all the different games for those who are not in the know yet. So definitely be on the lookout for our All-Star guide.